Work on Cardiff's bus station can finally begin after the city council gave its approval. The old city-centre bus station was demolished in 2015 as part of Central Square redevelopment. Cardiff Council said developer Rightacres had agreed to start early site works in April as soon as a final planning application was submitted. The confirmation on Wednesday brings 10 years of deliberations to an end. Final plans are set to include a 14-stand bus station, retail space as well as offices and apartments. Rightacres plans to appoint a contractor to the site by May or June this year. Councillors have previously stated the construction work would last about two years. Joint funding for the scheme has been agreed between the council, Rightacres and the Welsh government. Cardiff Council will not have to provide the majority of the funding. Huw Thomas, leader of Cardiff Council, said: "In effect we're getting a bus station for a cost of £50,000. I'm very pleased to say we have a commercial solution. "We will no longer need to find £15-20m of capital funding which means we can move onto other projects." 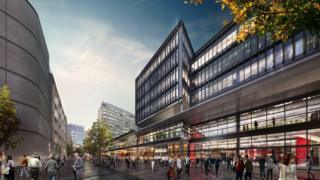 The Welsh government will buy the offices on the site which could then be sold once other investors are found. The council will hand over its leasehold interest in one part of Central Square to the Welsh government, which will buy the lease for the old Saunders Road car park site in return. The council will also keep its freehold and remain the landlord for the site as a whole.